During the Second World War 1939-1945, overseas surveying and mapping consisted of topographic survey, map reproduction and mensuration of aerial photography. Unlike in the First World War were the British Royal Engineers provided much of the geographic support for the Canadian Expeditionary Force (CEF), during the Second World War the Royal Canadian Engineers would provide geographic support for the Canadian Army. 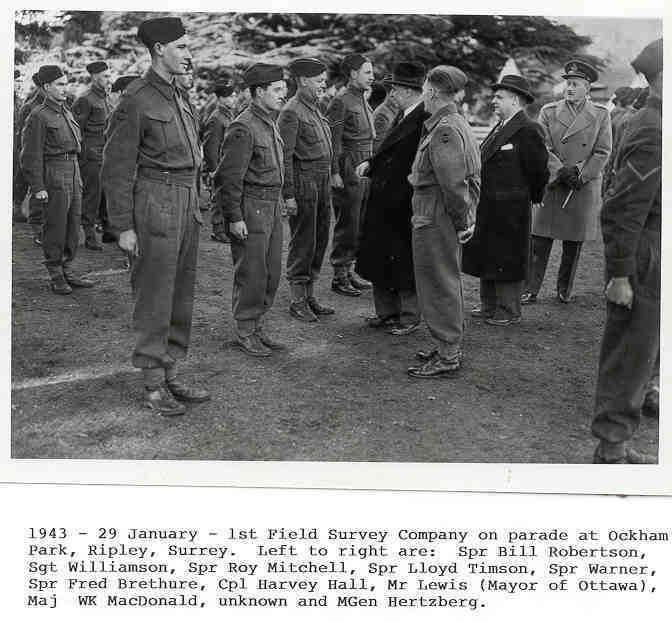 The 1st Canadian Corps Field Survey Company, Royal Canadian Engineers was activated on 3 September, 1939 and following recruiting and a short period of training, 7 officers and 137 other ranks sailed for the United Kingdom on 29 January, 1940. Once in the United Kingdom, the Canadian surveyors were active in producing defense overprint maps and artillery fire plans, both of which were in heavy demand. This was in addition to the numerous topographic maps that were also being reproduced. After the fall of France, every military unit in the United Kingdom was charged with the responsibility of local defence, pending an expected invasion by the Axis forces. The company was therefore allotted a sector of the River Itchen north of Southampton to defend until they could be relieved by a British force. During this early stage of the war, Canadian survey units were quickly developing techniques for production of maps from aerial photography. On December 8, 1941, in London, before an assembly of senior survey directors, Lt. LGS Trorey, R.C.E. presented a paper on “Mapping From Oblique Photos By High Oblique Plotter and Crone Method”. 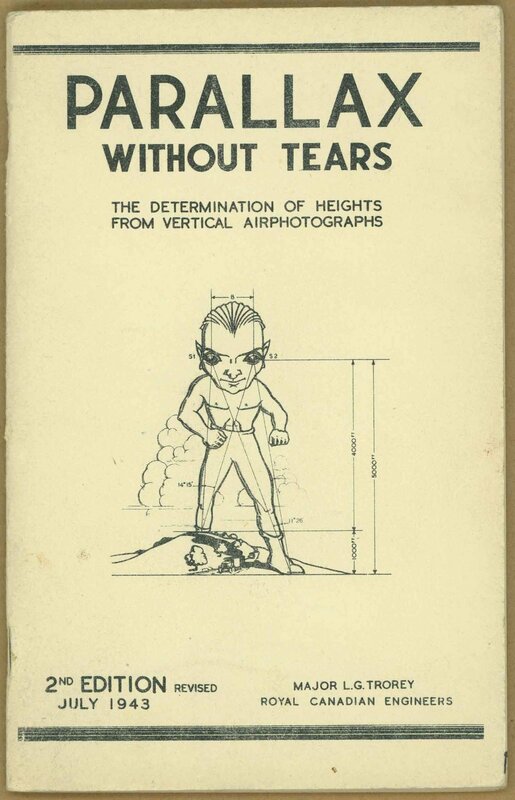 As a result, the recommendations of this assembly were to adopt the method of producing and updating maps from aerial stereo photography. Even though the use of aerial photography to provide the information for map updates had been pioneered during the First World War, map production still relied heavily on plain table and survey. Speed mapping tests were continuously conducted as part of operational training. One of these, covering a 58 square mile area at a scale of 1: 25 000, was completed in only 29 hours (from delivery of air photos to the final published three colour map sheet). In May, 1943, the 1st Field Survey Company was disbanded to form the 2nd Canadian Field (Topographic) Survey Company, 3rd Canadian Field (Reproduction) Survey Company and 4th Canadian Field (Air Survey) Survey Companies with 1 Canadian (Army) Field Survey Depot being established to coordinate training and provide a map depot. 30 Air Survey Section, Royal Canadian Engineers was formed in June, 1943, as a highly technical unit to be employed on special assignments connected with air survey. On 31 July, 1944, the field survey companies began their move from the United Kingdom to France in order to support the Allied campaign in Northwest Europe. The companies were again renamed for the final time in September, 1944, to 1 Canadian (Air) Survey Company, 2 Canadian (Topographic) Survey Company, 3 Canadian (Reproduction) Survey Company and 1 Canadian Army Field Survey Depot. Map production at this time was in support of ground operations and was primarily at scales of 1:25 000 and 1:50 000. As well, additional field survey tasks ranged from establishing radar site locations and azimuths, airfield surveys, to measuring gaps for assault crossings, to setting up the microphone grid used to locate German V2 rocket sites. Although aerial revision of maps was a task that was continuously carried out, the fast Allied advance soon outran the map area which had been revised for tactical purposes. Nevertheless by mid-September, 1944, 3 Canadian Field Survey (Reproduction) Company reported that all demands upon them for map reproduction had been met on time and in the quantities required. 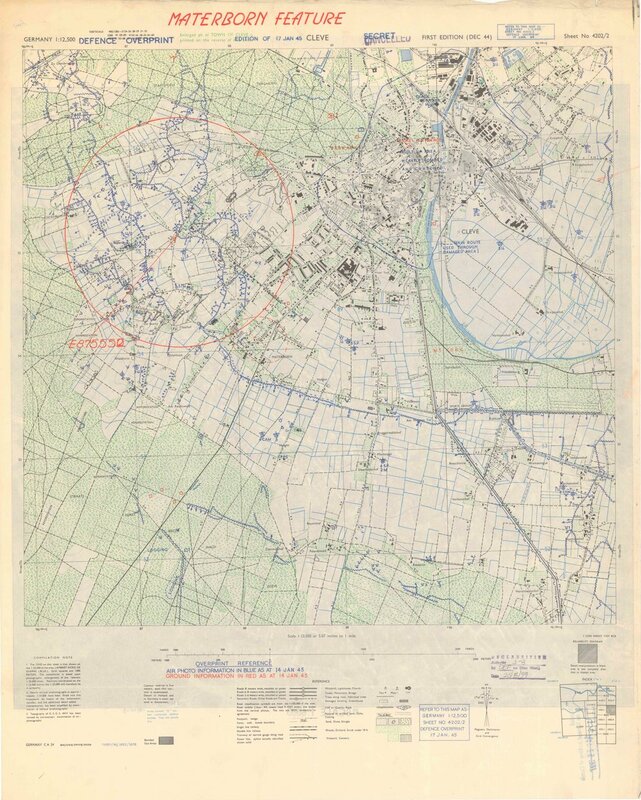 Throughout the winter of 1944, British and Canadian survey units laboured with the revision of 1: 25 000 German maps that covered the area beyond the Rhine River. As well, maps of the Netherlands from U.S. sources were also reworked as a four-colour edition. Using oblique aerial photography in stereo, 1 Canadian Field (Air) Survey Company was able to calculate and establish required bank heights of the Rhine River to within 2 feet (.6 meters). All of this work was in preparation for the upcoming Allied offensive to cross the Rhine River and strike into Germany. As the date of this planned crossing got closer, map printing increased, reaching 3 million in March, 1945. During the heaviest week of the campaign the company produced 304 000 maps with over 1 045 000 colour impressions. 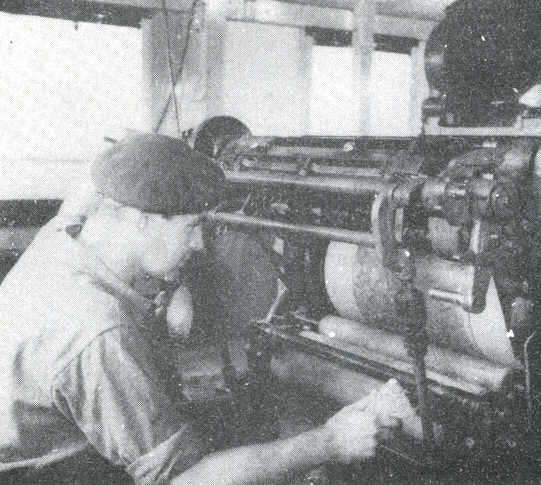 On March 17, 1945, 22 defense overprints were produced by 3rd Field Survey (Reproduction) Company at a rate of 11 per 30 hours. On March 12, 1945, the 2 Canadian Field (Topographic) Survey Company moved into Germany to support the 2nd Survey Regiment, Royal Canadian Artillery, for the upcoming operation to cross the Rhine. After the Rhine crossing on 24 March, 1945, topographers aided in the advance of Canadian troops into Germany and The Netherlands, conducting surveys of various bridge sites. On April 13, the 2 Canadian Field (Topographic) Survey Company reached Meppen, Germany, and by 5 May, 1945, the German surrender in Northwest Europe had taken place marking the end of the Second World War in Europe. 1. 178 map revisions, which consisted of 99 new maps at 1:25 000, 87 new maps at 1:12 500, 19 new maps at 1:10 000, and 45 new maps at 1:5 000 and 1:4 000. 2. Over 8 million maps were issued to the 1st Canadian Army, and a total of 14 million maps were handled. 3. As of 30 April, 1945, the map depot held over 4.8 million maps, consisting of 1550 different maps. The last move of the depot, including the maps, racks and ancillary items, all of which weighed 500 tons, took six days to complete. Taking into account the three specialist field survey companies and the field survey depot, over 700 Canadian mappers saw active service throughout the Northwest Europe campaign. Field surveyors made significant contributions during the war by conducting various survey tasks, and providing both map production and distribution to the Canadian Army. The experience gained in Europe would serve them well for once back in Canada the newly named Army Survey Establishment (ASE) would be given the important task of mapping Canada and especially its largely uncharted north. Did you know that Project ‘44 is a volunteer initiative?